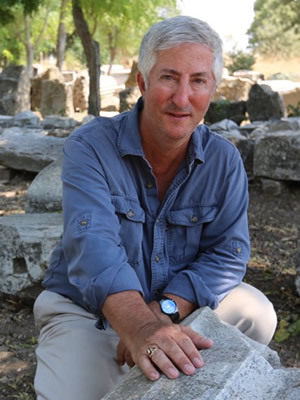 Dr. Eric H. Cline is Professor of Classics and Anthropology, former Chair of the Department of Classical and Near Eastern Languages and Civilizations, and current Director of the Capitol Archaeological Institute at The George Washington University, in Washington DC. A Fulbright scholar, National Geographic Explorer, and NEH Public Scholar, Dr. Cline holds degrees in Classical Archaeology, Near Eastern Archaeology, and Ancient History, from Dartmouth, Yale, and the University of Pennsylvania. An active field archaeologist who is the former co-director at Megiddo (biblical Armageddon) and the current co-director at Tel Kabri, he has more than 30 seasons of excavation and survey experience in Israel, Egypt, Jordan, Cyprus, Greece, Crete, and the United States. Dr. Cline has written (authored, co-authored, or edited) a total of 17 books, which have been published by prestigious presses including Princeton, Oxford, Cambridge, Michigan, and National Geographic. His books have been translated, or are currently being translated, into fifteen languages, including French, German, Italian, Dutch, Spanish, Portuguese, Czech, Turkish, Korean, Chinese, Japanese, Russian, Serbian, Bulgarian, and Hungarian. He is a three-time winner of the Biblical Archaeology Society’s “Best Popular Book on Archaeology” award (2001, 2009, and 2011). He also received the 2014 “Best Popular Book” award from the American Schools of Oriental Research for his book 1177 BC: The Year Civilization Collapsed, which is an international best-seller and was also considered for a 2015 Pulitzer Prize. In addition, he has also authored or co-authored nearly 100 academic articles, which have been published in peer-reviewed journals, festschriften, and conference volumes. At GW, Dr. Cline has won both the Trachtenberg Prize for Teaching Excellence and the Trachtenberg Prize for Faculty Scholarship, the two highest honors at the University; he is the first faculty member to have won both awards. He has also won the Archaeological Institute of America’s “Excellence in Undergraduate Teaching” Award and been nominated three times for the CASE US Professor of the Year. Dr. Cline has presented more than 300 scholarly and public lectures and presentations on his work to a wide variety of audiences both nationally and internationally, including at the Smithsonian Institution in Washington, DC, the Metropolitan Museum of Art and the Explorers Club in New York, and the Getty Villa and Skirball Museum in Los Angeles. He has also appeared in more than twenty television programs and documentaries, ranging from ABC (including Nightline and Good Morning America) to the BBC and the National Geographic, History, and Discovery Channels. His most recent book is Three Stones Make a Wall: The Story of Archaeology, published in 2017.